In a prior post I mentioned Coban keeping a busy schedule and was due to go to Iron Man Muay Thai in Vancouver, BC Canada. It looks like Coban is getting quite a bit of work on the seminar circuit. Thanks to Jake of Boston Muay Thai for bringing this one up. 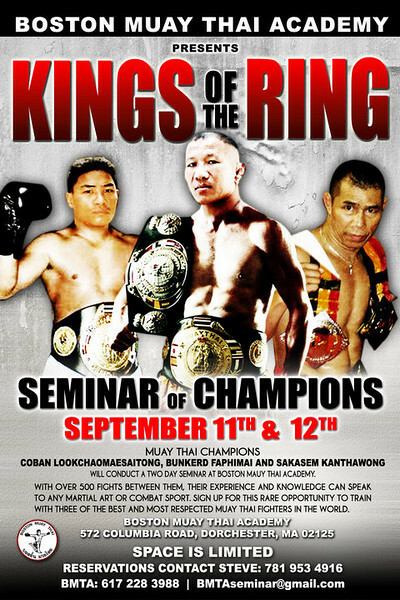 On Septemeber 11th and 12th Boston Muay Thai is host to 3 legends of the golden era of Muay Thai; Coban Lookchaomaesaitong, Saksem Kanthawong, and Bunkerd Faphmai. The latter two I know of from Fairtex USA’s first Arizona school. Bunkerd definitely has a lot of tactical knowledge and Sakasem is famous for pushing the conditioning of students. It’s good to see Muay Thai is alive on the east coast in the hearts of fans. Like the other seminars I post on I usually only do those I consider note worthy or unique and this coming seminar from Boston Muay Thai looks like it’s both. ~ by fatsoking on August 25, 2010.